After a brief career as a chemical engineer, Charles McCourt purchased a general equipment rental store. It was the first of six rental stores located in Pennsylvania, Maryland and Virginia. They were so successful, Mr. McCourt sold each to its respective manager. This freed him to pursue the manufacturing of a lightweight folding chair able to withstand the rental industry. In 1983, McCourt Manufacturing began producing the Series 2 Polypropylene Folding Chair in the heart of America; Fort Smith, Arkansas. McCourt Manufacturing has since produced our 5 millionth chair and introduced many lines of folding tables and stackable stationary chairs that, like our folding chairs, are designed for markets where hard usage is the norm rather than the exception. Today the Series 5TM stackable folding chair is the last chair of this kind to be manufactured completely in the USA! McCourt Manufacturing produces stackable folding chairs, stackable stationary chairs, plywood folding tables with the SuperCorner option, and other event products. Our Commercialite® blow-molded folding table peaks the industry in durability and affordability. All products come in a variety of sizes and colors, storage systems are also available. 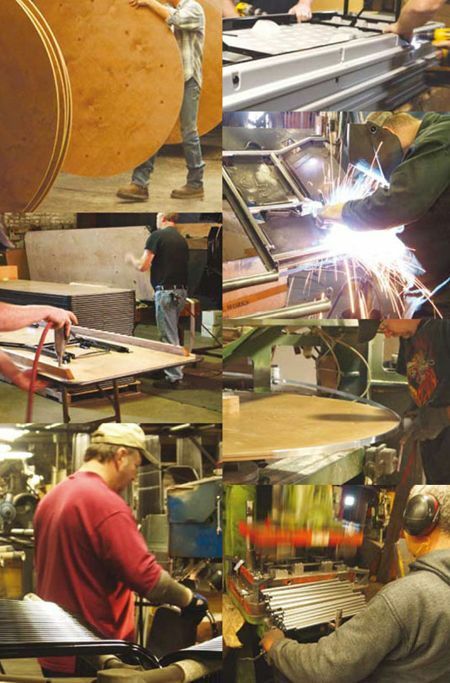 McCourt Manufacturing strives to produce affordable, quality tables and chairs for its customer base that includes purchasers from Canada, United Kingdom, France, Puerto Rico, Costa Rica, Australia, Norway, Sweden, Japan and Ecuador, as well as the United States. McCourt Manufacturing’s primary market is the rental industry, but we also supply the hospitality, school and church markets, as well as individuals and commercial businesses. The goal is to be the leader in this field.